Demeter Environmental Ltd was commissioned to prepare a Phase I Desk Study Report to support the planning application (12/2012/0347) for the demolition of the existing offices/workshop and the erection of a two story office building. 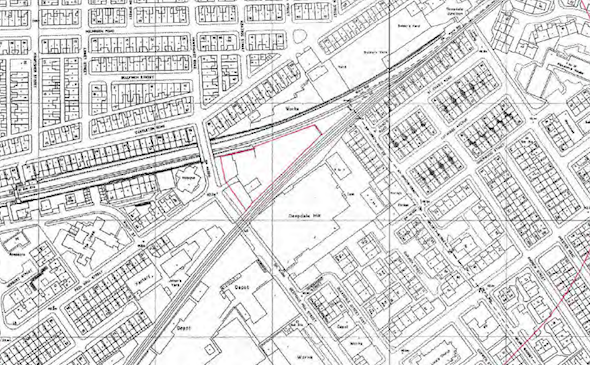 The site was being used as a sales yard for commercial vehicles at the time of the walkover and is located on a wedge of land bounded by former railway lines and is on the boundary between a commercial and residential area of Preston. The site was developed between the first edition (1846) map and 1892, by which time the site was occupied by a number of terraced dwellings on the western boundary, a saw mill on the northern boundary and a siding on the southern boundary. By 1912 a number of additional buildings were identified on the site and by 1931 the buildings on the central area had been demolished. The sidings were no longer identified on the 1938 map and by 1958 the site had been cleared and with the exception of the dwellings, the layout is the same as current maps. The dwellings were demolished between 1985 and 1993. 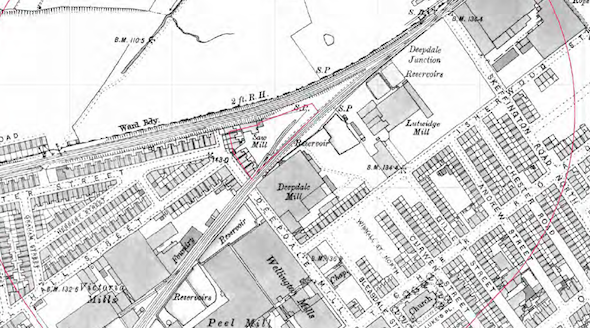 Initially the site boundaries were formed by railway lines (north and south) and open land to the west, by 1892 the western boundary was formed by a row of terraced houses and Deepdale Mill Street. The dwellings adjoining the site were demolished between 1985 and 1993. A number of potentially contaminative land uses were identified within 250m of the site including numerous mills, a foundry and numerous parcels of in-filled land. The walkover survey revealed that the site was an active sales yard with a variety of vehicles including plant, concrete mixers and refuse trucks. A tank was identified on the southern face of the office buildings and after a through inspection of the area there was no visual or olfactory evidence of contamination. Given the industrial legacy of the site and the number of parcels of in-filled land within 250m of the site a site investigation was proposed to determine if the pollution linkages identified in the desk study report were present. Two options were presented to assess the risk from ground gases on the site, an argument was made that if a reasonable worst case scenario, based on the information in the desk study report, was taken, gas protection measures would be more appropriate rather than undertake a gas monitoring exercise for the site. The desk study report was submitted with the planning application and the report was accepted by the council (Memo from ‘Environmental Health’). The report was revised in July 2014 to incorporate the revised development (residential), which was submitted as part of application 12/2012/0347, the revised report was accepted and the proposals for further intrusive works were accepted.